If solitude and a reasonable room rate are more important than being in the center of the action, Bungalows is your place. This quaint little inn is situated just above the Marina. Rooms are simply decorated with Mexican textiles, lovely quilts, and art, yet they have all the creature comforts like flat screens, microwaves, mini-fridges, handmade soaps, and French press coffee makers. Rates include Wi-Fi, daily coffee and tea, and access to a huge DVD library (popcorn included). A cluster of two-story buildings frame a small, heated pool with lush landscaping. The hotel offers a mouthwatering Mexican breakfast served under a poolside palapa that could include anything from banana-walnut pancakes to a stuffed breakfast burrito. The Bungalows Hotel is about 10 blocks from the beach, 5 blocks from the Marina and a 15-minute walk from Cabo San Lucas town. Request the honeymoon suite with a large patio or bungalow #3 for the most privacy. 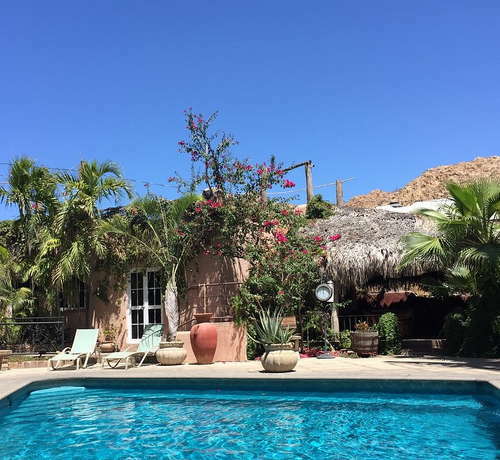 Bungalows display a mix of traditional and contemporary Mexican décor, from tile floors, artisanal furnishings and regional art to wooden cabinets and private patios with stone fountains and hand woven hammocks. All feature king or queen beds, and en suite amenities like kitchenettes, complimentary Wi-Fi, and televisions with DVD players. All rooms include kitchenettes with microwaves, mini-refrigerators, and French press coffee makers. Hand-painted tiles add a bit of local color to the bathroom facilities, which also include handmade soaps. Hair dryers and curling irons are standard. There is no real lobby at The Bungalows, just an office area that segues into the kitchen and the patio restaurant beyond. A DVD library offers on-site entertainment options. The irregularly-shaped, rectangular pool is the central courtyard fixture, and is temperature controlled to account for seasonal temperature changes. Chaise lounges fringe the pool, as do umbrella-shaded tables for rest and recreation. Breakfast may be the only meal offering at The Bungalows, but it’s an epic gourmet feast. The rotating daily menu features a rich variety of fresh fruit or vegetable packed pancakes, waffles, frittatas and omelets--as well as strong coffee, and freshly squeezed juices that remain available throughout the day. The morning meal is served on an intimate patio deck, with stone and wrought iron tables topped with freshly cut flowers grouped around a burbling, colonial-style fountain. The Bungalows is a bit off the beaten path, which means an added level of peace and quiet, but also longer walks. A winding three-block walk is required to reach downtown Cabo San Lucas, and the return trip is all uphill; something to remember after multi-course dinners with family or friends. 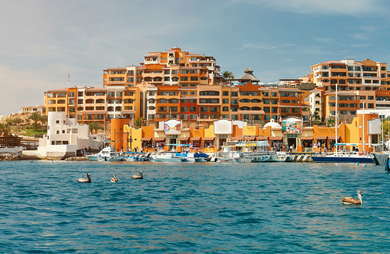 Trips to the main beach are a hike, although water taxis from the marina can cut the travel time in half. Rental cars are necessary for day trips to Todos Santos or La Paz. Invita Bistro offers delicious and affordable Italian fare across from the town square (a 7-minute walk away on Calle Hidalgo). Traditional Mexican dishes are the specialty of the house at Mi Casa (across the square from Invita, on Calle Cabo San Lucas). Visit nearby Pancho’s (7-minute walk to Calle Hidalgo) to sample from one of the world’s largest collections of tequila and mezcal. At last count, Pancho’s boasted over 540 different labels showcasing the country’s signature spirits. Everybody gets hugs at this family-owned lodging, and the vibe extends to warm relationships with fellow guests. The bungalows themselves are clean and comfy, with hammocks headlining the terrace amenities.